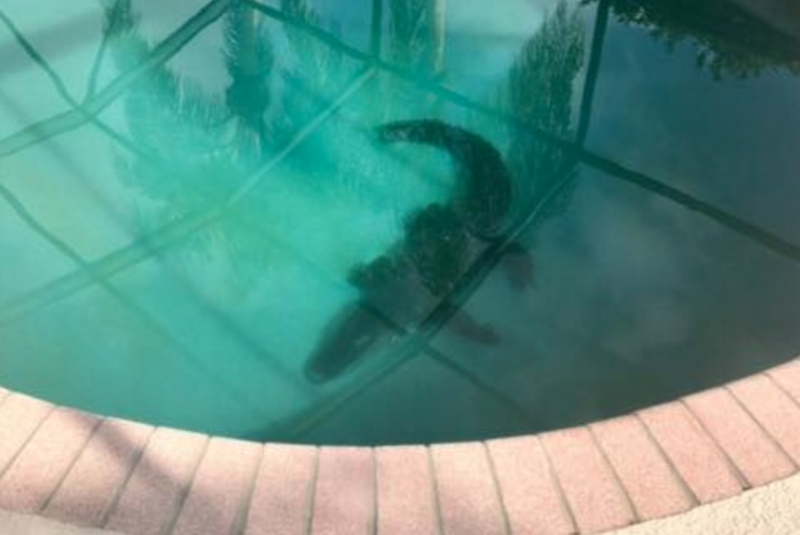 In Florida, it's probably a good idea to thoroughly check all corners of your swimming pool before diving in — you never know when a massive alligator may be waiting for you at the bottom. That's a warning the Sarasota County Sheriff's Office is spreading after getting a call Monday from a woman cleaning a family's pool in Venice. At the bottom of the chlorine-filled pool sat a 7-to-8-foot female gator. "Clearly this was a chlorine-filled pool, which is a reminder to people, especially Floridians, that they could be in just about any body of water," Kaitlyn Perez, public information officer for the Sarasota County Sheriff's Office, told CBS News. "Nothing surprises us anymore." The woman immediately called Florida Fish and Wildlife for assistance, as well as a non-emergency line. Since the family wasn't home at the time, a deputy had to be present while wildlife workers removed and relocated the giant creature. At first, the gator remained still, but as soon as members of the Florida Fish and Wildlife crew hooked a wire around its neck, it began wildly thrashing. As they pulled it closer to a set of stairs in shallow water, the gator launched into a "death roll," an offensive move used to drown prey. "That death roll blows your mind," Perez said. "Fortunately, multiple agencies responded quickly and removed the gator safely." Sarasota County Sheriff's Deputy Lori Clark, who responded to the call, shared a video of the impressive catch on the Sarasota County Sheriff's Office Facebook page. It went viral with more than 215,000 views as of Tuesday morning. "Can he pull you in?" one man was overheard on video asking a worker as he wrangled the gator to the surface. "Oh yeah, he can pull you in easily," the worker replied. "Let this be a reminder that it's mating season in Florida and these creatures, especially the females, are on the move looking for areas to lay eggs," Perez said. "With that said, it's probably safe to assume that any body of water, regardless of what kind, may be enticing to this kind of reptile." Perez said the sheriff's office got a call about a gator on a tennis court a few weeks ago, but the size of that gator didn't compare to this one. "It's captivating," Perez said, describing the video and photos of the scene. "This has gotten us more attention than any prior post we've made for several years. People love to see animals." While the impressive catch has caught the internet's attention, Perez reminds locals and visitors that the overall message is about safety. "Be aware," she warned. "Look before you leap."